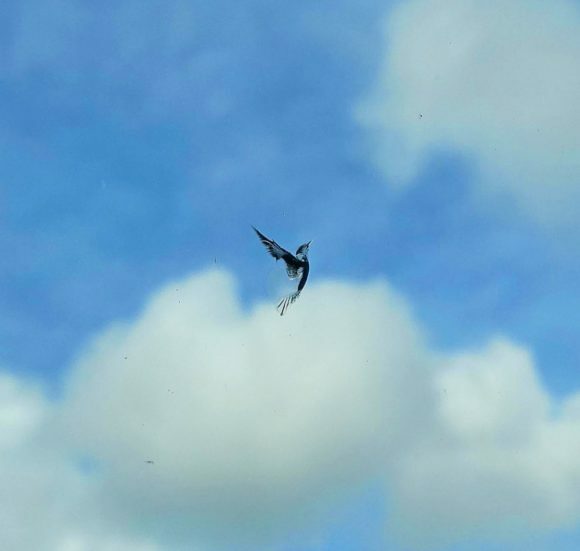 As we were trekking through the everglades, we saw a flying object shoot right up into the sky. It was probably traveling about 30-40km/h. We had no idea what it was. My friend quickly picked up his binoculars and noticed that it was a bird. A bird he could not identify or ever seen before. It had a translucent body. The way it took flight was magnificent. We were in awe. Did my story sound compelling enough to make you believe you are looking at a new species of bird? Ha. I gotchu! Your eyes and mind are playing tricks with you. Look closely at the image once again. Really zoom in. This was actually a stone chip on the windshield of my friends car before we set out on our hike. This was my highlight with the best optical illusions of the week. Comment below if you thought this was a bird as well. What should we name it? Next How Do You Have This Happen To You At Work? You could name it the stone chipper. Yes, I did think it was a bird!